Edge is still lacking some of the basic features Which Browser Is Best? Edge vs. Chrome vs. Opera vs. Firefox Which Browser Is Best? 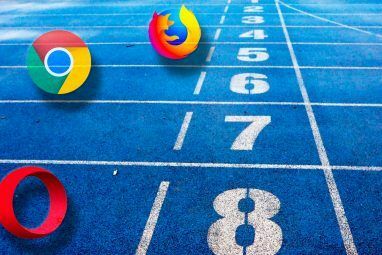 Edge vs. Chrome vs. Opera vs. Firefox The browser you're using right now may not be the best one for you. The browser arena changes so frequently that your conclusions from comparisons made last year may be completely wrong this year. Read More we’ve come to expect from other browsers – the most obvious of which is extensions. But that doesn’t mean there aren’t lots of cool customizations and tweaks that you can make already, all of which will help Edge work exactly the way you want it to. Here is our list of the top seven tweaks you should make right now. At the time of writing, Edge doesn’t support third-party themes like Chrome and Firefox. While that may change in the future, there are already two built-in themes to choose from – one light and one dark. To switch between the two, fire up the main menu by clicking on the three horizontal dots in the top right-hand corner of the window, then select Settings. The first option on the list is Choose a Theme. You can select your preferred choice from the drop-down list underneath. By default, Edge doesn’t load a homepage when you launch the browser. This is intentional, Microsoft believes that the notion of homepages is starting to become outdated as web usage evolves. That doesn’t mean that you can’t set one, however. Edge actually offers four different choices for what you’ll see upon opening it – the Start Page (Edge’s main page which includes a personalized news feed), a new blank tab, a list of your previously visited sites, and a specific web page. To set your preferred homepage, click on the three horizontal dots and choose Settings. Scroll down to Open With and mark the checkbox next to Specific Page or Pages. You’ll then be shown a drop-down list, select Custom. Now you’ll be able to add your preferred homepage in the space provided. It’s worth mentioning that you can also change what you see when you open a new tab. Just choose your preferred option from the list under Open New Tabs With. If you enjoy using a homepage and you’ve taken the time to select your own, you’ll presumably want to enable the home screen button next to the browser’s Forward, Back, and Refresh icons. To turn it on, click the three dots and head to Settings > Advanced Settings. The first item on the list is Show the Home Button option. Flick the slider to add it to your screen. There is one plug-in that does work on Microsoft Edge – the ubiquitous-but-maligned Adobe Flash Player. There are lots of reasons why many people believe Flash Player needs to die Why Flash Needs to Die (And How You Can Get Rid of It) Why Flash Needs to Die (And How You Can Get Rid of It) The Internet's relationship with Flash has been rocky for a while. Once, it was a universal standard on the web. Now, it looks like it may be headed to the chopping block. What changed? Read More : it’s insecure, it’s closed and proprietary, and it’s been overtaken by other web standards. If you’re one of the increasing number of people who’d like to see Flash Player consigned to the annals of history, you can play your part by disabling it within the browser. To do so, click on the three horizontal dots, go to Settings > Advanced Settings, then move the slider under Use Adobe Flash Player to Off. Be aware that some websites might lose certain aspects of their functionality if you turn it off. Yes, we know Bing is slowly growing in popularity, and yes, we know there are lots of more privacy-friendly search engines Why This Longtime Google Fan Now Prefers DuckDuckGo Why This Longtime Google Fan Now Prefers DuckDuckGo Most of us don't remember life before Google search. Try DuckDuckGo. Learn its tricks. There could be nothing you miss about Google. Read More than Google. However, it remains a fact that the Mountain View-based behemoth enjoys a 65-70 percent share of the search market. Second-placed Bing comes in around 15 percent. With those figures in mind, there are bound to be many people out there who want to make Google their default search engine Which Search Engine Should You Be Using Today? Which Search Engine Should You Be Using Today? There are many search engines out there, but which one is the best for you? Read More on Edge. Thankfully, it’s easy to change; you can use any search provider you want as long as it supports the OpenSearch standard. The first thing you’ll need to do is visit your desired search engine’s homepage. This will allow Edge to automatically recognize it and add it to its list of options. Next, click Menu > Settings > Advanced Settings, scroll down until you see Search in the Address Bar With, and click Change. You’ll be presented with a list of all the available options. Highlight your preference then click on Set as Default. 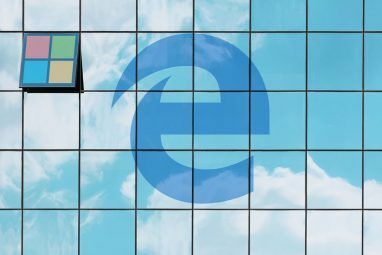 One of the best new features of Edge 10 Reasons You Should Be Using Microsoft Edge Now 10 Reasons You Should Be Using Microsoft Edge Now Microsoft Edge marks a complete break from the Internet Explorer brand name, killing off a 20-year-old family tree in the process. Here's why you should be using it. Read More from a usability perspective is “My News Feed”. It will automatically show you news and weather from your location, but if you’d like a more personalized feel it is possible to tweak it. Simply click on Customize in the top right-hand corner above your list of news. You’ll be presented with a menu that allows you to select your language and location, as well as choosing your favorite topics. The downside is that the topics are very limited; cars, entertainment, lifestyle, money, news, and sport are the only six options available (where’s technology?!). We’d like to think that Microsoft plans to significantly expand on these options in future updates, but at the moment you’ll have to make do. Strangely, Edge’s default setting is to allow all cookies (cue the Microsoft privacy/tracking conspiracies Everything You Need to Know About Windows 10's Privacy Issues Everything You Need to Know About Windows 10's Privacy Issues While Windows 10 has some issues that users need to be aware of, many claims have been blown out of proportion. Here's our guide to everything you need to know about Windows 10's privacy issues. Read More !). If you want to change this and block either all cookies or just third-party cookies, you’ll need to head to Menu > Settings > Advanced Settings > Cookies. You’ll see a drop-down menu that offers you the necessary choices. You should definitely block third-party cookies by default. They have no real benefit to the user and are mainly used for data gathering purposes. 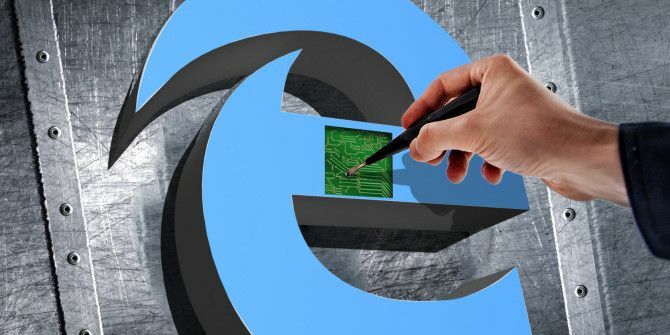 We know Edge still has a long way to go until it can truly compete with Chrome, Firefox, and Safari, but we hope these customizations will go a long way to making it more usable until Microsoft gets around to releasing some updates. Which tweaks and customizations have you discovered that you can share with your fellow readers? We’d love to hear from you. You can let us know all your hints and tips in the comments sections below. What a lame post about cookies, turning off cookies will disable some services on websites especially on trusted websites. This one about cookies is NOT A RECOMMENDED tweak for edge. Maybe you post more beneficial tweak like how to save bandwidth in EDGE, that's more interesting that these posted tweaks of yours. The ability to choose your favorites in the News Feed is not available in the latest version that I downloaded and so now it's all or nothing - so away it goes. Which is a shame because I like having a quick news feed on the home page. Oh well. Select More (…) on the address bar, then Settings. Enter the URL of your home page and select Save. and the home page you talk about in the article above? if you click on the 'home button" you will go to the home page specified in the home button, not the home page that you talk about in this article. can't be two home pages. what is going on?